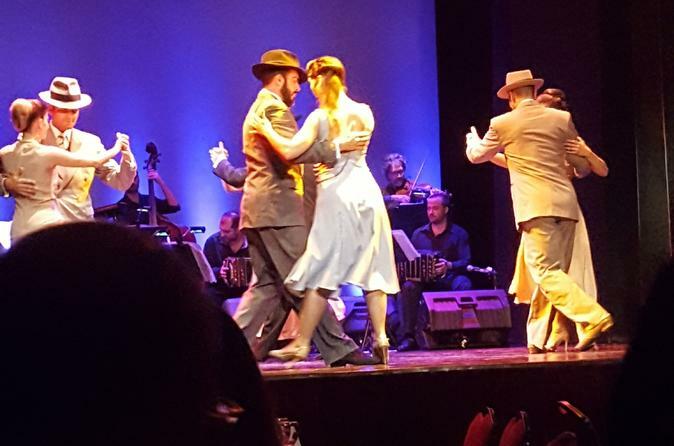 Immerse yourself in Buenos Aires’ tango scene as you visit a traditional milonga, watch a tango show and take a tango lesson. This 4.5-hour evening tour allows you to discover to famous dance like a local and practice your tango moves in a fun and relaxed atmosphere. After your dance class, enjoy dinner and drinks (included) as the professionals take to the stage for a spectacular tango show. During the first 45 minutes, two professional dancers provided dance lessons. The steps are simple enough so most newbies will be able to remember the steps. By the way, both professional dancers are excellent and exhibited their skills during the evening’s tango show. The dance lessons were followed by dinner, which is not memorable. The highlight of the evening is the tango show, with four pairs of dancers showing consummate skill and grace. Two singers — both great — also performed several Argentinian songs. Music for the dancers and singers were provided by an excellent band.Negatives: First, my wife and I were supposed to be picked up our hotel. We were staying in the San Telmo area, and didn’t know there is a flea market every Sunday that closes several streets, including the ones around our hotel. So 45 minutes before our scheduled pickup, the hotel front desk got a call from the driver of our pickup service asking that we walk to a meeting point several blocks away. Since we just arrived in Buenos Aires that afternoon and it is our first visit to Buenos Aires, we are unfamiliar with the area (and concerned with safety). We had a hard time finding the address provided by the driver (it’s hard to see street names and addresses in the dark, although Google maps certainly helped). Second, after the tango show, no transportation service back to the hotel was provided so my wife and I were out in an area that is unfamiliar to us. We tried getting Uber but that didn’t work, so we finally hailed a cab, again not knowing if that is safe or not.While we enjoyed the show, this review offers some caveats to those visiting Buenos Aires for the first time. Excellent! Fun group lessons, great meal, and a spectacular show! My wife has always dreamed of doing an Argentine tango in Buenos Aires. This gave us a great opportunity to do just that and to see how the pro's do it! We had a comfortable and punctual hotel pick up and delivered along with some other couples and families to a theatre below the Galeria Guemes. The architecture was fantastic. We had our lesson in a mini theatre/ballroom before the main meal and event taking place in a larger environment. The lesson was aimed at beginners like myself taken by two of the main dancers in the show. We learned some basic steps which could then be built on and added to if needed. We didn't feel under pressure to take part and the steps were explained in such a way that they were easy to follow. We didn't feel singled out and we didn't feel uncomfortable at any point - we loved it. The meal was of a high standard with a choice offered from a set menu. My only grumble was the amount of time between the meal and the actual show beginning - it felt like a long time, but once the show started we were spellbound by the music, the singers and of course the dancers. The show lasted over 90 minutes, before being bus'd back to our hotel. Overall we really enjoyed our evening. If you're a beginner at dancing, do the lesson! if you're more advanced then you might consider a different package without the lesson. Recommended and one for the Buenos Aires bucket list to tick off! I truly enjoyed this experience. The Tango show was excellent, the food and wine were amazing, and the dance lesson prior to show was fun. I went with a group of friends so we didn't have any dance partners but there was staff there to walk us through the steps with a partner so we didn't feel left out. The lesson is not really a lesson, 10 minutos for 12 people.... The meal is poor, not worth while. But the show is very good and the theatre is amazing. The show was excellent, wonderful music and dancing. This show was amazing. The tango dance lesson was fun. I learned some basic moves. However, it was short. The food was delicious as well. Finally, the show was entertaining. I would highly recommend this show.